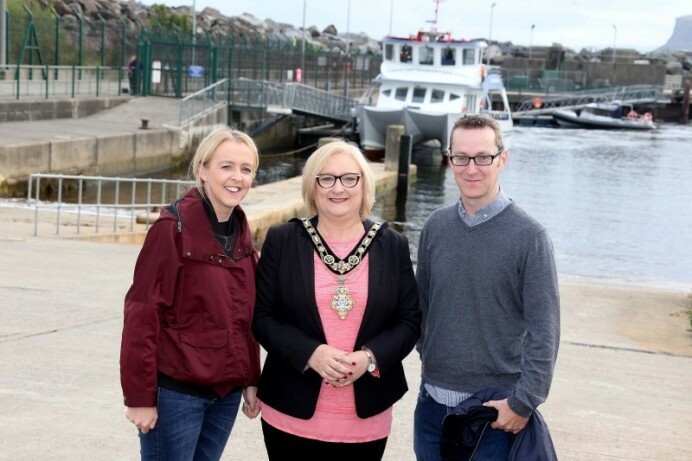 Councillor Brenda Chivers was joined by some of her party colleagues for the ferry journey across the Sea of Moyle where she met with members of the island community. Speaking afterwards, she said: “I would like to thank everyone for their very warm welcome during what was my first ever visit to Rathlin Island. I was greatly impressed by its beauty and tranquillity which were matched by a clear sense of community pride. The island is a unique asset which greatly enhances the tourism appeal of the entire Causeway Coast and Glens area. The Mayor of Causeway Coast and Glens Borough Council Councillor Brenda Chivers pictured at Ballycastle harbour with Cara McShane and Philip McGuigan ahead of her recent visit to Rathlin Island.